On May 10, 2018 abortion providers, doctors, activists, faith leaders, and advocates from across the country met in Washington DC to take to the Hill and lobby for the Women’s Health Protection Act (WHPA; S.510/H.R. 1322). The Act for Women campaign takes aim at Targeted Regulation of Abortion Provider (TRAP) laws and overturning the unnecessary restrictions placed on abortion care. This federal legislation would prohibit states from imposing restrictions on abortion that apply to NO OTHER MEDICAL CARE, interfere with patient’s personal decision making, and block access to safe, legal abortion care. Before the lobby day began, delegations from each state attended a training to learn about the bill and the individual needs of their state. A reception following the training gave us all a chance to meet, greet, and eat! Attendees of this reception included WHPA’s first champions, Senator Richard Blumenthal (D-CT) and Representative Judy Chu (D-CA) who originally introduced the legislation in 2013. We heard from the President and CEO of The Center for Reproductive Rights, Nancy Northup, who is familiar with fighting TRAP laws across the country, including the landmark Supreme Court Whole Woman’s Health v. Hellersteadt case decided in 2016. The Executive Director of the National Latina Institute for Reproductive Health, Jessica Gonzales-Rojas, discussed the unique and challenging circumstances faced by the Latinx community seeking reproductive health services. Each presenter expressed the dire need for federal legislation to combat restrictive state legislation and to protect the bodily autonomy of pregnant people. We were motivated by each speaker and ready to head to the Hill the next day. The next morning, a breakfast meeting was held to pump up delegates for a day on the Hill. Key speakers Lourdes Rivera, the Senior Vice President of US Programs at the Center for Reproductive Rights, Dr. Willie Parker, an OB/GYN and man of faith, and Beatrice Kahn, the President of the National Council of Jewish Women Board of Directors, outlined realities to share with each staffer and representative. The Michigan Delegation was composed of providers, doctors, and student advocates. 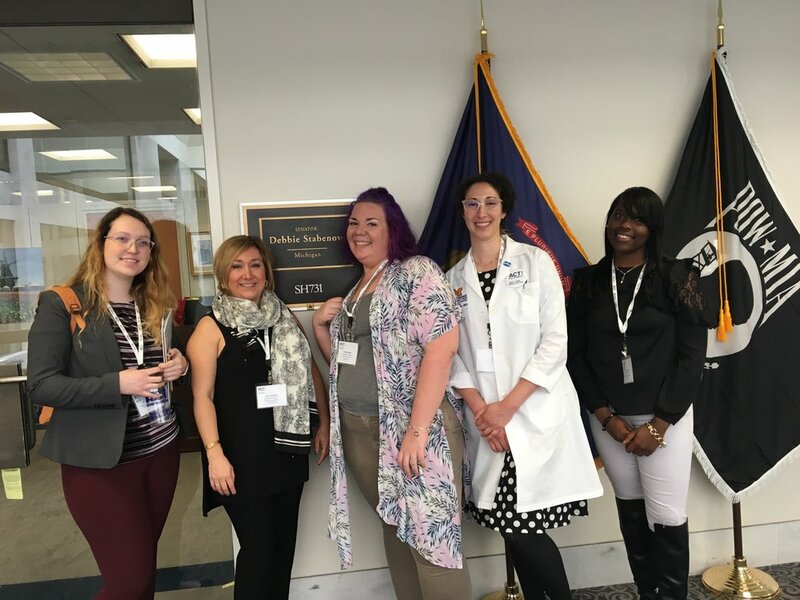 We met with the offices of Senator Debbie Stabenow (D-MI), Representative Debbie Dingell (D-MI), Representative Brenda Lawrence (D-MI), and Representative Dan Kildee (D-MI). We had a pretty simple docket compared to other anti-choice areas of the country. We started by visiting the offices of Sen. Stabenow, Rep. Lawrence, and Rep Kildee to thank them for their continued support of WHPA. Each staffer we spoke with was proud of their boss’ stance on protecting abortion rights. Everyone asked us how they could get more involved on the ground in their home state, and we look forward to continuing to work with our State Reps and Senators. Our challenge for lobby day was to get Rep. Dingell, the ONLY Michigan Democrat to not sign on to this legislation, on board. The Representative is noted as a champion for women’s rights, leaving us to wonder why she has yet to sign on to this legislation. In the spirit of keeping WHPA in the foreground, we are asking everyone we know (especially if they’re in Michigan’s 12th District: Ann Arbor, Ypsilanti, Van Buren, Taylor, or Dearborn) to contact Rep. Dingell’s office and urge her to sign on to the Women’s Health Protection Act because access to abortion should not depend on your zip code! Her office can be reached at (202) 225-4071. Ask Rep. Dingell to sign on to the Women’s Health Protection Act today! All our representatives can be reached at this number! Call and thank them for their continued support! Here are some photos of the Michigan Delegation. We can’t wait to return in 2 years and lobby for important and timely legislation! Michigan takes on the Hill! Sometimes you have to go with gravity! Exhausted but still smiling! Rep. Dan Kildee's office welcomed two Flint natives!